August 31st marks the 80th birthday for Frank Robinson. This is the first Topps Card to feature Robinson wearing an Orioles Cap. He was issued an O's card in 1966 but it was in the classic Topps 1960s era Hatless style of traded players and it is quite clear that the future Hall of Famer is wearing Reds colors. On December 9th 1965 the Reds traded the 1956 Rookie of the Year and 1961 NL MVP to the Orioles for a Young Milt Pappas and a couple of other prospects. The photo from the 1967T card above likely captures Robinson sometime during that epic 1966 season. 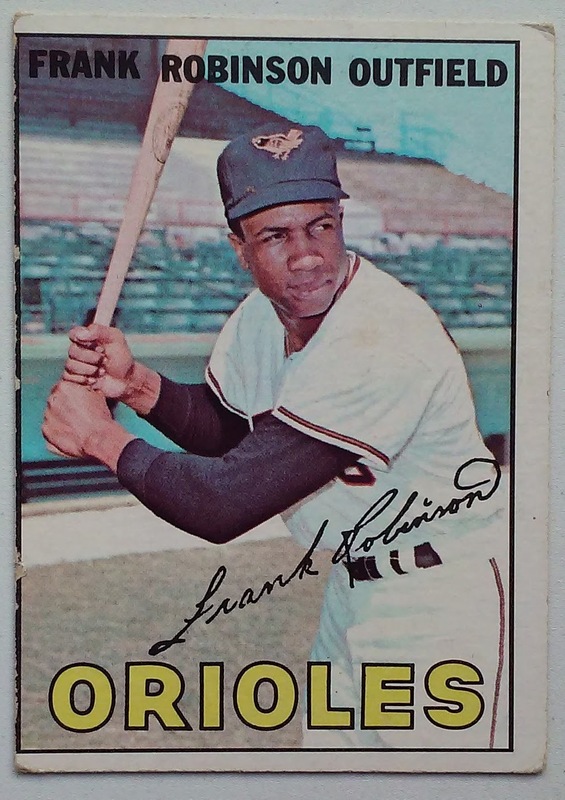 Topps awarded Robinson the First Hero Card in the 1967 set (#100) - he also appears on a Special #1 card in the set. 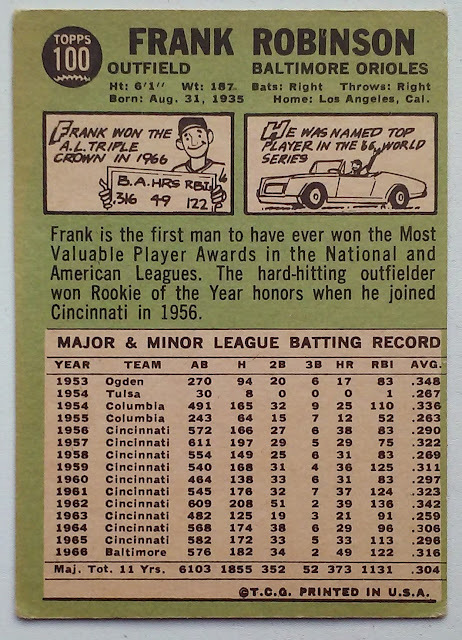 It was the 2nd time that Frank Robinson drew a Hero Number, he was on card #400 in 1963. 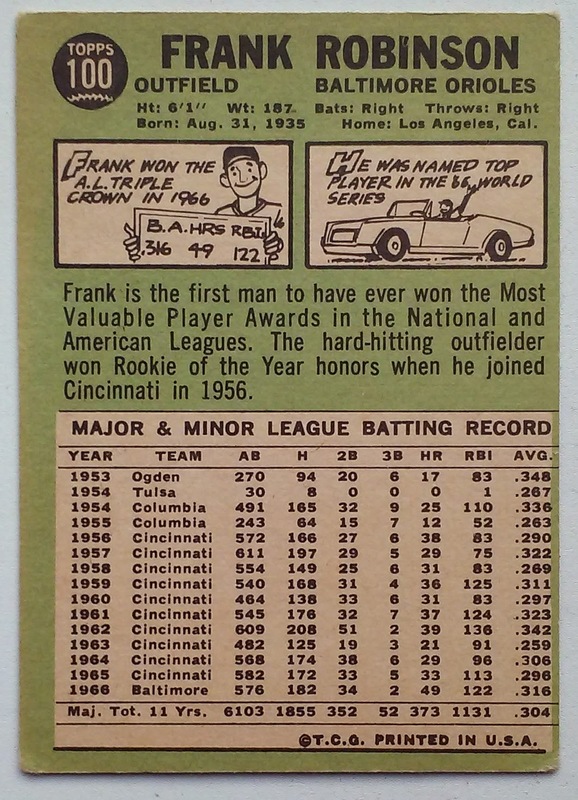 The back of Frank Robinson's 1967T card covers a lot of the info we have above, Triple Crown -Toon, World Series MVP -Toon and Rookie of the Year text. Had to bum out Reds fans of the era to see Cincinnati listed there 10 times followed by the MVP year with a different squad. The Triple Crown resulted in a unanimous AL MVP award for Robinson. Had SABRmetrics been available at the time I doubt that there would have been the debate that occurred when Miguel Cabrera pulled off the trifecta in 2012 but was pushed by Mike Trout. In addition to leading Junior Circuit Hitters in HR, RBI and Batting Average Robinson also led the group in oWAR. It should however be noted that Pitcher Earl Wilson led all AL Players in WAR for the 1966 season, he finished 14th in the MVP voting. In an Award Voting Quirk Wilson did not receive a single Cy Young award vote that season. At the time there was only one CY award shared by the two leagues - and voters cast the first place vote only. Wilson had the misfortune of having his great season while Sandy Koufax was having a better season. 1966 was the last time that MLB handed out only one Cy Young award. 1988 Fresh Air interview with Terry Gross, 13 minutes discusses issues with segregation & baseball. Little League World Series: Go Red Land PA!